We are located in Worcester Township at the heart of Montgomery County. 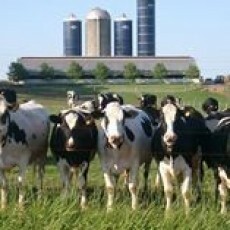 We are a family owned and operated working dairy farm and farm market. Merrymead is one of Pennsylvania's Century Farms and has been in the same family for over 100 years. Registered Holstein cows supply the National Quality Award Winning Milk - which is processed, packaged and sold on the premises, along with buttermilk, heavy cream, and half & half. Enjoy a delicious ice cream cone or take home a Gram's Apple pie, fresh from our bakery! Highlights of Merrymead, a farm for all seasons, include: a large selection of locally grown bedding plants, local produce, honey, beef & pork products, and so much more! We provide educational spring/summer/fall group tours, a harvest celebration which includes "The Lighting of the Great Pumpkin", a Cornfield Maze, a Live Nativity presentation, and Christmas trees and greens. The farm and farm market are open to visitors year round. Dairy Farm, Ice Cream Store, Garden Center, Bakery, Harvest Days/Birthday Parties/School Tours and more! Merrymead invites you to visit the farm animals and observe the cow milking from 3:30 PM to 6:00 PM daily. Farm animals include baby chicks and ducklings in the spring, cows, baby calves, sheep, bunnies, peacocks, goats, "Franklin" the pig, and "Tootsie" the donkey.